At Noël Design Build, we always replace waste piping when remodeling kitchens and bathrooms. It is one of the things we do as part of our commitment to our clients and the longevity of your investment. 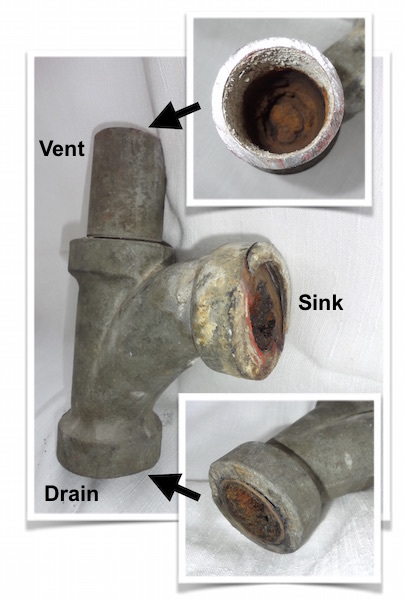 Over the years, the interior of metal pipes corrode. The openings for waste water become obstructed and fixtures can be slow to drain. According to the National Association of Home Builders, the average age of houses in Washington, DC is 74. Original waste piping in older homes (those built before 1960) is usually made of galvanized steel or cast iron. Unless the waste plumbing in your house was replaced after 1990, you almost certainly have metal waste pipes. We cut away this section of drain and vent pipe from underneath the kitchen sink on a recent job. The opening to the vent was completely blocked. The kitchen had been renovated 15 years ago, but the contractor took a shortcut and didn’t replace the waste pipes. Noël Design Build installed PVC waste and vent pipes. The clients won’t hear that “glug glug sound” anymore and the kitchen sink will drain freely for many years to come.